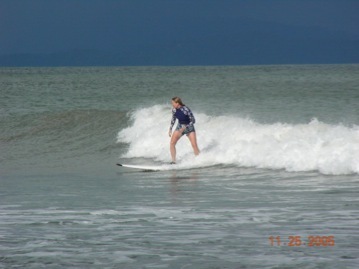 Costa Rica is famous for its surf. Both the Caribbean and Pacific Coasts offer great waves. One of the best destinations and until recently “undiscovered,” is the Matapalo area. Although now known in the surfing world, the Matapalo waves are still very uncrowded due to the limited access, lack of places to stay and distance from San Jose. 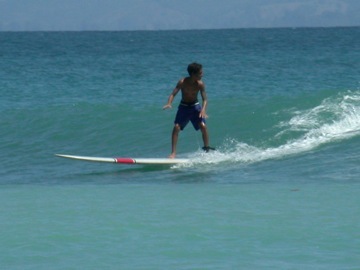 Surfing at Cabo Matapalo is a unique surfing experience. The ocean is clean and warm. The view of land is incredible, with scarlet macaws flying by and howler monkey calls echoing out of the forest. Because the breaks are inside the gulf, glassy conditions almost always persist. The good waves combined with lush vistas of the rainforest make this one of the most beautiful places you can surf. 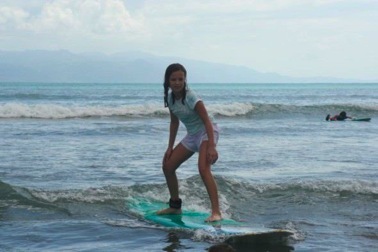 If you have never surfed before and have always wanted to try, this is the perfect opportunity. 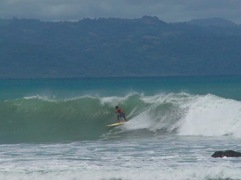 Bosque del Cabo uses a company called Tres Peces for surf lessons for our guests. Tres Peces offers a great experience in the water- they provide the boards, rash guards and fun, upbeat expert instructors. Your instructor guarantees to get you standing up during that first lesson. The lessons last approximately 2 hours, and the activity is dependent on the swell and space (please remember that surf conditions can change from day to day). You can either hike to the beach, or arrange a ride for a small charge. Don’t forget your sunscreen! If you are an experienced surfer and you have your own board or rent one from the lodge, you can head down to the surf breaks on your own. Novice surfers should only surf at the inside Pan Dulce break. Dangerous conditions could arise from beginners trying to surf at areas for experienced surfers. And, on a personal note, we hope that our guests show respect for others in the water. While the beach and waves are public and open to anyone, local surfers would love for visiting surfers to help maintain the spirit of fun and community that has predominated here for over 20 years. Please practice “surf etiquette” when you are surfing (like don’t drop in, don’t take every wave, and don’t show up with a huge group of people and dominate the entire break), and you will help keep these breaks a surfer’s paradise. 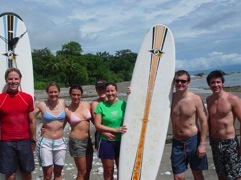 The surfing beaches are reached from Bosque del Cabo by either hiking (40 minutes to Matapalo) or driving (10 minutes). We offer a drop off/pick up service to the beach ($10 each way). Matapalo- A powerful right-hand wave that breaks best at midtide. Can be extremely challenging on big swells. Due to the fact that it faces open ocean, it receives more waves, more consistently than the other spots. Backwash- A fun right that breaks in the middle of Backwash Bay. Although it doesn’t break as many days per year as Matapalo, it is the spot of choice when it is at its best (from midtide to lowtide). Pan Dulce- A long right point break. Pan Dulce is rideable only on the larger swells that wrap into the gulf. If you are lucky to catch it good, you can expect rides up to 500 meters long. This beach offers a good wave for beginners when the swell is small at low-medium tide. Pavones- Across the Golfo Dulce, this beach is accessible from Bosque del Cabo by boat. Pavones is a well-known, world-class wave with lefts up to a kilometer+ long. 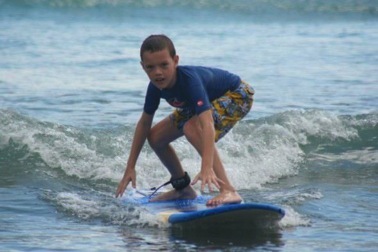 Click here to go to the Pollo Surfschool website!